The original is a very large drawing in colour, beautifully executed by a real professional. showing the projected development from the main camp to the old Auschwitz bridge. There is no date, number or draftsman's name, but it probably dates from 1941 or 1942. 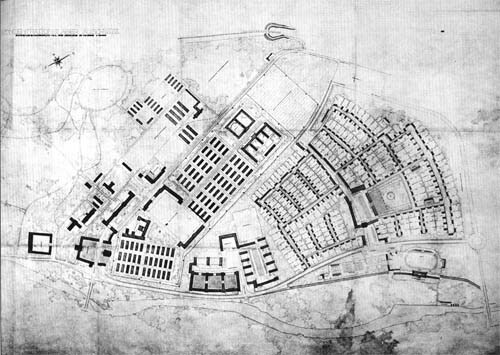 Detai1 of the plan of the New Garrison Headquarters, BW 173, divided into four sctions — VII, VIII, IX and × — as on the existing drawings. The small sketch below the development plan shows the layout of the SS accommodation in the north wing of the New Garrison Headquarters, BW/ Worksite 173, as represented on seven existing drawings,all dated 14th, December 1942: 58A, 57A, 56A [Trakt / section VII). 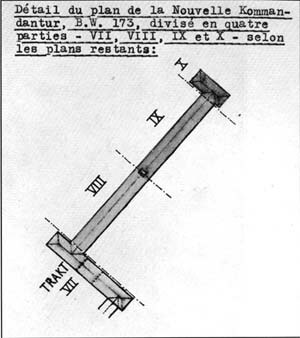 61 A (section VIII), 64A (section IX), 62A (section IX-X) and 65A (section X), produced under the direction of one Werkmann, an architect sent from Berlin, who worked in the Auschitz Bauleitung only until 31st December 1942. These seven drawings give an idea of the scale of the planned development.